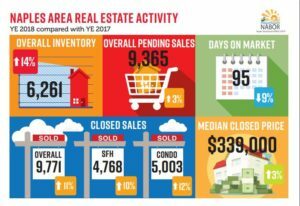 The Naples area housing market ended 2018 with impressive annual activity statistics in all areas of the residential real estate market including an 11 percent increase in total closed sales and a 14 percent increase in inventory compared to 2017. Sales of homes over $1 million continued to drive the market in 2018, especially in the condominium market where closed sales of condominiums over $1 million increased 37 percent! 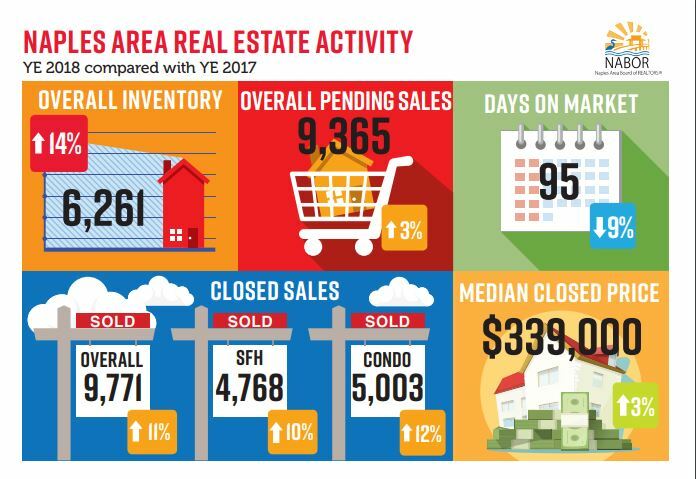 According to the Year End 2018 Market Report released by the Naples Area Board of REALTORS® (NABOR®), which tracks home listings and sales within Collier County, inventory at the end of 2018 was the highest on record in six years. Single-family homes in the Naples Beach area reported the highest median closed price increase (14 percent) in 2018 compared to 2017. But that’s most likely due to closed sales of a few multimillion homes that took place last year including a $48.8 million transaction in June for a home in Port Royal. While the Ave Maria/Immokalee area also reported the highest increase in single-family inventory (40 percent) among all geographic areas tracked, the single-family home inventory in Central Naples increased 38 percent to 391 homes in 2018 from 283 homes in 2017. As pointed out by another local Broker, the 3 percent increase in overall pending sales for 2018 concerned him at first as it looked too low compared to activity in other areas of the report. However, after much discussion with several broker analysts also reviewing the annual market report , it was determined that, the smaller-than-expected increase was because many closings for a large percentage of homes under contract in the 4th quarter of 2017 were delayed while repairs from Hurricane Irma damage took place. If you are looking to buy or sell a home in Naples, please contact me, I have the experience and knowledge to provide an accurate market comparison or negotiate a sale. It would be my honor to assist you and your friends and family with your real estate needs. Feel free to contact me anytime.